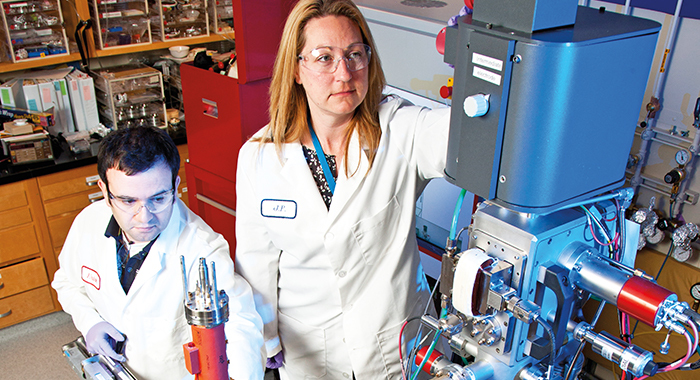 Matzel (above, with colleague Ben Jacobsen), a researcher in the Nuclear & Chemical Sciences Division at the Lawrence Livermore National Laboratory, uses radioactive elements to determine the age of materials and trace their origins. From magma chambers to comet dust to nuclear fuel materials, her research is the common thread that ties the specializations together. While earning her Ph.D., Matzel researched magma chambers in Washington, using uranium and other radioactive elements to determine how those chambers formed. That research led her to post-doctoral work at the Berkeley Geochronology Center and then to Lawrence Livermore National Laboratory in California, where she worked on NASA’s Stardust space mission. Matzel studied dust particles from a comet and determined their ages. “It was a pretty exciting mission. NASA hadn’t done sample-return missions in a long time. 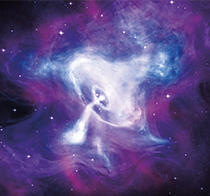 So, to have these particles back on Earth … it was really interesting,” she says. Matzel and her team of researchers focus on developing tools to help United States organizations like the International Atomic Energy Agency monitor nuclear facilities worldwide. Jenny (Piontek) Matzel ’95 hasn’t left the great beyond behind her just yet. Though she completed her work on NASA’s Stardust mission in 2010, she’s hoping to continue working in cosmochemistry. Recently, Matzel worked with a group that developed a plan to fly a spacecraft to another comet, but it didn’t make it through NASA’s competitive selection process. “It was an eye-opening experience to see what it takes to get one of those missions approved and to actually receive samples,” she says. That hasn’t turned her off the idea, though. She says she’s going to keep looking for ways to work with NASA while she continues her work on nuclear materials.